Available with only one engine choice, V12 lovers will lament the lack of choice in the Aston Martin DB11 Volante. Power comes from an AMG-sourced 4.0-liter bi-turbo V8, generating 503hp and 498 lb-ft. An 8-speed ZF automatic gearbox is the only transmission, sending power to the rear wheels. 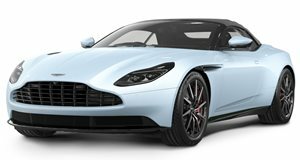 Q by Aston Martin allows a full range of customization options on the DB11 Volante – with numerous paint colors and upholstery options to choose from. Available safety options include a 360-degree camera, front and rear park sensors, and blind spot monitoring. 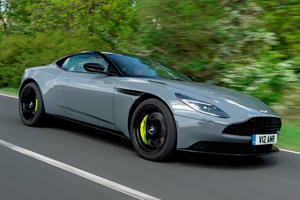 In Aston Martin speak, Volante is code for convertible. It’s the suffix applied to any drop-top Aston from the British based firm – the latest of which is the DB11 Volante. It’s based on the DB11 Coupe, but unlike its coupe sibling, there’s only one engine available under the hood of this soft top convertible. It’s not a V12 either, borrowing twin-turbo AMG-power to drive this uber-tourer along against rivals like the Ferrari Portofino, Mercedes-AMG S63 Convertible. 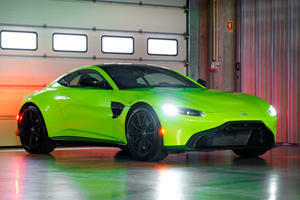 But less weight and boosted torque ease the pain of the loss of the V12, leaving things hopeful for the new era of Aston convertibles. Despite the loss of the roof, and the necessity to store the soft-top and its mechanism when the roof is down, the DB11 Volante still features the rear seats. Though classified as a 2+2 seater, the rear seats are impossible for all but double amputees to use, and are best regarded as storage space. However the front seats, available with power adjustment and heated functionality are extremely comfortable, with impressive head room. However, with Mercedes’ involvement and the center console hailing from Germany, the broad center tunnel impedes leg room to an extent. The central stack features Aston martin design flare, but key elements betray its Mercedes-Benz origins – such as the rotary controller and standalone 8-inch infotainment screen on the dashboard. But the leathers, rich luxurious, soft leathers are all Aston Martin – hand stitched and available in a range of exotic colors with contrast stitching, quilting, and other finishes. The DB11 Volante saves 57 pounds compared to the old DB9 Volante, whilst being 5% stiffer. Despite reshuffling of weight for the roof mechanism, weight distribution is still close to perfect, with a 47/53 split front/rear. It bodes well for overall balance, and slewing the DB11 Volante through a set of corners will be an enjoyable experience. Though the steering retains sharp responses from the coupe, the wheel itself is a little cumbersome. But that’s soon forgotten with the available balance on offer, with huge amounts of grip, both front and rear. The V8 benefits from a tweaked suspension compared to the V12 coupe, allowing for a keener front end, more direct responses, and an overall sharper experience that transitions from grand tourer to sports car in the blink of an eye. Despite this, adaptive damping keeps things comfortable. In the suspension’s softer setting there can be a bit of heave, but otherwise body motions and ride comfort are sublimely controlled. Like the V8 Coupe, standard equipment is generous, and unless you’re looking for a tailored touch, a base spec model will be more than good enough. Features like keyless entry, leather upholstery, dual-zone climate, 360-degree camera, and front and rear parking sensors are all standard. Options range from custom upholstery to ventilated seats, along with a range of custom colors available through Q by Aston Martin. Standard safety includes abs and electronic stability control, but features like blind spot monitoring and automatic parking are also available. As with most sports cars, no local crash testing has occurred. A slightly less rigid body has never really compromised a good GT car. The open top DB11 Volante loses a little rigidity, but gains a luxurious open air experience in the process. With the V8, performance is still mega, and handling is sharper than ever. 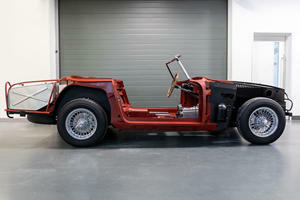 It's the only convertible made with the DB4 GT engine. What will happen in around 80 days from now? No one knows. Now this is how to take the initiative.